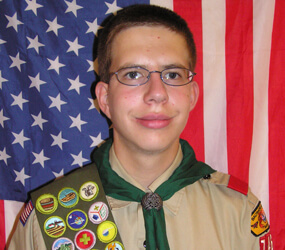 Benjamin Lelonek is to achieve the rank of Eagle Scout during a Troop 746 court of honor ceremony at St. Joseph in Fullerton. For his Eagle project, Lelonek beautified the parish grounds, in preparation for the placement of a statue of St. Joseph that is a memorial to the late Monsignor James J. Cronin. Lelonek coordinated the spreading of five tandem truckloads of dirt, the building of the mound where the statue is placed, the raising of a storm drain and landscaping of the area. Lelonek, 16, is a rising junior at Calvert Hall College High School in Towson, where he is in the McMullen Scholars program.